Imagine for a moment you’re happily married. You and your significant other are gainfully employed as a veterinarian and an au pair/event planner. You recently purchased your first home, where you’ve lived for the past month, and you’re eager to build a family around your new baby boy. Life is normal. Life is good. It’s all turned upside-down, however, after taking your 5-month-old to the doctor. The diagnosis: acute lymphoblastic leukemia (ALL). Your son is given one week to live. While the aforementioned situation is likely difficult for most to imagine, it’s Lydia Carneson’s reality. Leukemia, which is the most common form of cancer among children and teenagers, accounts for nearly one in three cases, according to the American Cancer Society. When it happens, however, fear, disbelief and isolation sets in. “It was devastating,” says Sarah Thomsen, who remembers the day a friend’s 18-month old son was diagnosed with ALL. Thomsen knew she wanted to find some way to be supportive of her friend and the countless other families facing similar situations but had no clue where to begin. It’s that extreme range of emotions that characterizes the lives of families receiving support from TDF, and it’s that same range of emotions that prompts volunteers like Thomsen to look for ways to do more, which is why she approached the general manager of her gym — TITLE Boxing Club Liberty Township’s Matt Gregory — to host a fundraiser benefitting the nonprofit. Gregory makes it a priority to find ways to immerse TITLE in the community by giving back on a monthly basis while also helping members — whom he refers to as “family” — reach their goals physically, socially and emotionally. Like so many others, Gregory’s life has also been touched by childhood cancer, as his mother, who teaches third grade at a local elementary school, experienced the loss of one of her students to diffuse intrinsic pontine glioma (DIPG), an aggressive and difficult-to-treat brain tumor. But how does one get through such a seemingly hopeless situation? After Reef Carneson was given one week to live, Lydia and her husband Ryan were beside themselves. “It just exploded our whole lives,” Lydia says. Reef surpassed his prognosis, undergoing six months of chemotherapy at the South African hospital near the family’s home, but the ALL was too aggressive, and without a bone marrow transplant remission was unattainable. With an unrelated donor from Germany, Reef underwent the transplant one week prior to his first birthday. 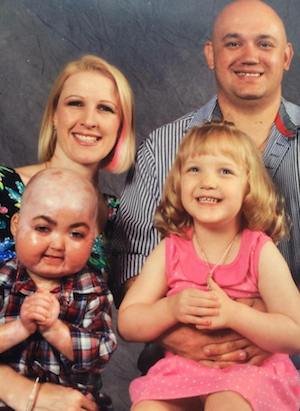 “He was the youngest bone marrow transplant ever done in South Africa, and also the first childhood survivor,” Lydia says. But there were many complications, especially graft versus host disease (GVHD), where one’s immune system recognizes donor cells as foreign and therefore fights back. The Carnesons had no other option but to pack up their belongings, leave their family and country behind and transfer Reef to Children’s Hospital Los Angeles. They received excellent care for four years but led a life of solitude. But the hospital was able to help Reef. His GVHD was no longer life threatening. 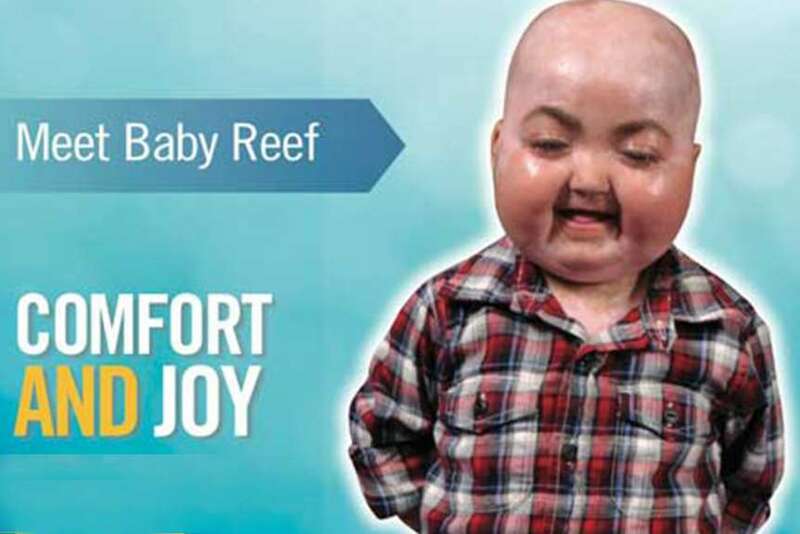 A secondary cancer developed, however — a rare form of skin cancer that appeared on the top of Reef’s head — and Children’s Hospital L.A. was unable to treat it. Another transition was in store. The Carnesons traveled here for an evaluation at Cincinnati Children’s Hospital Medical Center, and their experience at both the hospital and within the city turned their temporary stay into a more permanent move. “It was a completely different feel from L.A.,” Lydia says. “It was family-oriented, a slower pace of life, and people were so friendly. Literally we would walk into the grocery store and everybody would be chatting to us. The nonprofit offers a variety of services. “I Am Still Me,” for example, fosters a sense of identity and self-esteem in those undergoing treatments that result in hair loss. The Landing — a 6,000 square-foot clubhouse where children and their families can go to unwind, build community and take their minds off their cancer hardship — is a family favorite, as is the Dragonfly Suite at U.S. Bank Arena, where families have the opportunity to attend events in a safe, sanitary environment. Reef, now 7 years old, has had the opportunity to attend Cincinnati Reds games, too, as a result of TDF, which does its best to help provide positive distractions in the lives of those who can so easily become consumed by fears and responsibilities stemming from the disease. Like Reef, TITLE’s Gregory also loves baseball and knows and appreciates the power of a positive outlet. Gregory’s baseball career ended at the age of 17, at which point he wanted to find an activity that would not only allow him to engage in physical fitness without further injuring his knee but also keep his mind occupied. For Gregory’s girlfriend, also a TITLE member, the club offered solace during a time of intense grief following the death of her mother. For a TITLE trainer, who had previously dealt with anger issues, the club offered positive energy and redirection for his life. Regardless of one’s circumstance, it’s the ways in which we choose to occupy our time and the compassion that we share with others that can change lives, TDF co-founder Davidson says. Medicine, in the traditional sense, is working for Reef. Though his skin cancer will never be cured, it’s well managed and the Carnesons are in a much better place than they were seven years ago. And, throughout it all, love abounds. You can support TDF by attending TITLE Boxing Club Liberty Township‘s 75-minute boxing class at 9 a.m. April 30. A $10 donation gets you 10 rounds of boxing and a chance to bid on a collection of raffle items: free personal training sessions, a two-month TITLE membership and more. Gloves will be provided, but for sanitary purposes hand wraps must be purchased at the door (20 percent of proceeds from wraps will also support TDF).